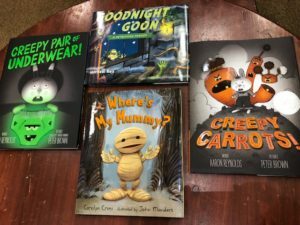 Looking for the perfect Halloween picture book to get your little goblins and ghouls ready for the holiday? I stopped by my local bookstore to see what was on the shelf. There is no small supply of hauntingly good spooky stories (but not too spooky). Here are a few of my favorites. You remember the classic, Goodnight Moon? The Halloween sister title is Goodnight Goon. Saying goodnight to all of the things you’d expect to find in a dark and dreaded dungeon, will be the perfect bedtime story for all of your little monsters. If you have little mummies who aren’t ready to say goodnight, they would love to have one last game of hide and seek with mommy mummy. One brave baby mummy isn’t afraid of the things that go rattle and shake in the dark. But, what happens when mommy mummy finds the perfect hiding spot? Will baby mummy still be brave? Readers beware: you think you know what you’re getting into when you start reading Creepy Carrots, but looks can be deceiving. Baby bunny is trying to keep those creepy carrots trapped. But who set the best trap of all? One good book deserves a squeal. If you couldn’t get enough of Creepy Carrots, then your little pumpkins may also enjoy Creepy Pair of Underwear! The brave little bunny is back and this time he’s battling creepy underwear. Just like with the carrots, he has a plan for the underwear. What are your favorite Halloween titles? My kids read, but during the summer they aren’t as motivated because it’s no longer a required school activity. I’ve found myself having to poke, prod, and plead with them to read each day. Until I remembered when the movie Ready Player One came out. My oldest spotted the book on a shelf at the grocery store and begged me to buy it so he could read it before going to see the movie. I bought it because he seemed interested, however the movie was set to release within one week and the book is 579 pages. He was determined to finish by the premiere, and he did. Not because I begged him to or because it was an assignment, but because he wanted to. Some kids are natural bookworms and devour books, but mine aren’t as inclined if they don’t have some kind of buy in. What’s a mom to do? 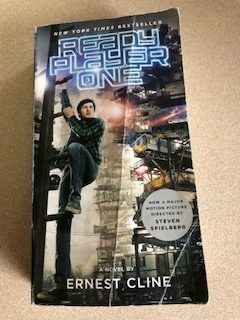 Inspired by the Ready Player One anecdote, I’ve tried to find more books made into movies. It gives them motivation to read other than their mother bugging them each day. In the end, I want my kids to grow up and enjoy reading and seek to do it of their own freewill in whatever subject interests them. I’m able to tap into that motivation with books made into movies. My oldest is currently reading and watching his way through the Harry Potter series. For his younger siblings, we have the entire collection of Wimpy Kid books. Lucky for me, some picture books have also been made into movies too. Kids in my house at every age can enjoy a good book and a good movie. 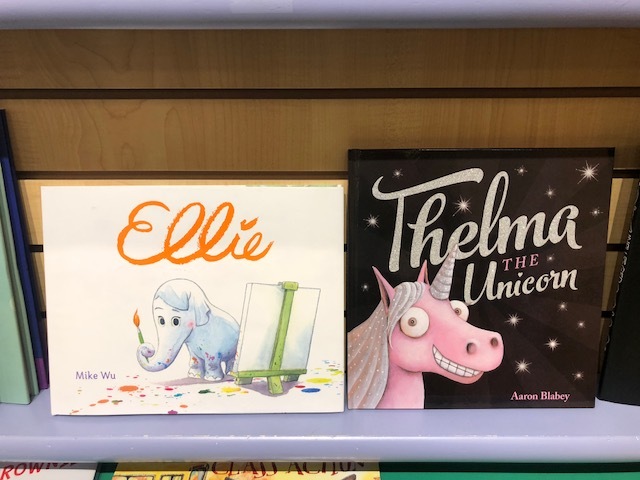 I recently visited the children’s department at my local Barnes & Noble and found a whole wall dedicated to famous book characters. Classic titles as well as more recent ones lined the shelves and I stopped to get acquainted with a couple. Ellie by Mike Wu puts a new spin on the dilemma of wanting to help, but not knowing how. Ellie and the other animals at the zoo want to help clean up in a last ditch effort to keep the zoo doors from closing for good. Every animal has a special talent they put to use, everyone except for Ellie. Until, she finds a paint brush and adds some amazing artwork which brings crowds of people. I love the message for young kids. So often children want to help with big or small projects but they don’t know how. It’s important to show them they don’t have to be big to help or even have a special talent. Showing up, pitching in, and having the desire is what makes a difference. Thelma the Unicorn by Aaron Blabey is a timely story of a horse who thinks her life would be better as a unicorn. When she is given the opportunity to disguise herself as a unicorn, she finds that being a unicorn isn’t as magical as she thought it was. It’s easy to think that if we were someone else, lived somewhere else, had other circumstances, our life would be perfect. But, the grass isn’t always greener on the other side and there are people in our lives, who love us for who we are right now. All you have to do, is you. If I had more time, I would have loved to read more. Who are your favorite children’s book characters of new or old? All last year I was busy taking classes for my LDE (Linguistically Diverse Educator) Certification for work. It was valuable because I was able to learn best practices that I could immediately apply in the classroom and the courses helped me to grow as an educator. It also meant I had to sacrifice time away from family, friends, and writing. Starting the new year, I feel like a bear waking up from hibernation. While it was important for me to focus on school last year, now, I will have more time to do the things I enjoy. To help get back into the writing saddle, I’ve decided to take a writing challenge. 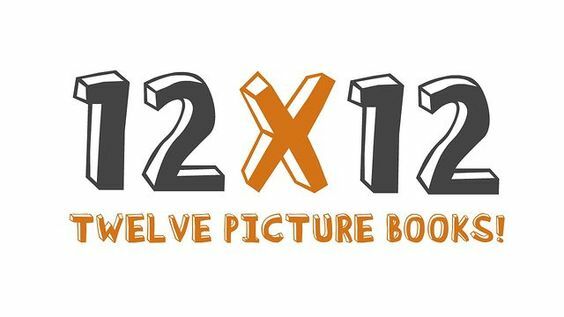 I signed up for 12 x 12, with goal of writing 12 picture book drafts by the end of the year. It’s broken up into manageable chunks of writing one picture book draft each month. Going to conferences, taking classes, and participating in online challenges and courses is a great way to help jump start motivation. It’s also a great way to hold yourself accountable and learn the craft of writing for children. What classes, courses, or conferences (in person or online) have you found to be beneficial? As a kindergarten teacher, I am gearing up to go back to school in a couple of weeks. In preparation, one of the items on my to-do list was hit the bookstore to find some good reads. When I arrived, I felt like I struck gold because I found a few of my favorite titles came out with sequels and they did not disappoint. One great thing about reading books from the same author is the ability to compare and contrast. I think my little ones will be entertained and delighted to compare these titles! Caution: spoiler alert! 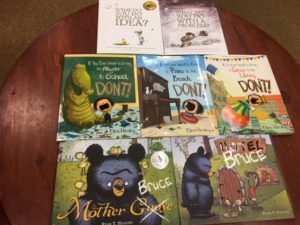 Good ole grumpy Bruce the bear is back with a whole new problem. He returns from migration (with his geese from the original story) only to find mice have transformed his house into a hotel. You gotta love Bruce because in the end, he may just be a giant teddy bear at heart who can find room for a few visitors to stay. If You Ever Wanted to Bring an Alligator to School DON’T!/ If You Ever Want to Bring a Piano to the Beach DON’T!/ If You Ever Want to Bring a Circus to the Library DON’T! These stories have an If You Give a Mouse a Cookie, feel. The charming alligator lover is back to show readers why you shouldn’t bring a circus to the library (they are for sitting quiet and reading)! And why its a bad idea to take a piano to the beach (when your mom asks you what you want to bring, she means a frisbee or a shovel)! What Do You Do with an Idea?/What Do You Do with a Problem? If you thought ideas made you nervous, wait until a problem comes along. Just like ideas, you can’t ignore problem because they grow (and unlike ideas, you don’t want that to happen). But when you tackle a problem, you may find it really isn’t so scary after all. I love to get my kindergarten class excited about reading. The best tool in my toolbox for this task is a great book to share. What are some of your favorite picture books? 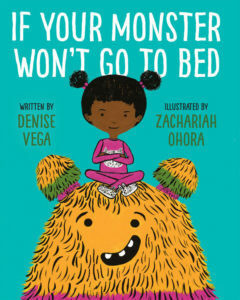 Denise Vega is the award-winning author of seven books from toddler to teen, including her newest picture book, If Your Monster Won’t Go To Bed as well as Build a Burrito: A Counting Book in English and Spanish, illustrated by Caldecott Medal winner David Diaz and Grandmother, Have the Angels Come? illustrated by Erin Eitter Kono (Colorado Book Award winner, Colorado Authors’ League Award, Américas Award Commended Title). 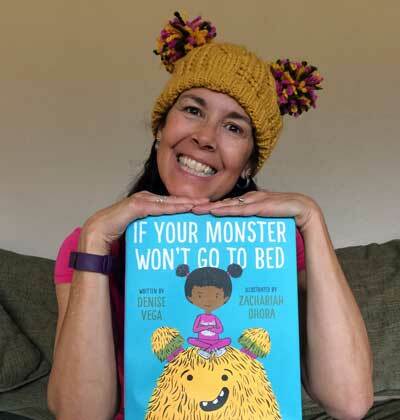 Denise is a former co-Regional Advisor for the Rocky Mountain Chapter of the SCBWI, on faculty at Lighthouse Writers Workshop, and a Young Adult Mentor for the Regis University MFA in Creative Writing. She lives in Denver with her family where she loves to hike, walk, swim, read, eat French fries and watch out for monsters. Find out more about Denise, her books, and her idiosyncrasies at www.denisevega.com. What was your inspiration for the story If Your Monster Won’t Go To Bed? I can’t remember exactly, but I think it was a combination of things. I had written another monster story and also a “role switching” story with kids putting parents to bed–an idea that I abandoned when I found out it had already been done by a much more skilled author than myself. I think my subconscious started putting these two ideas together at some point and the story began to prod me. Which came first, the characters or the plot? How did you blend the two? 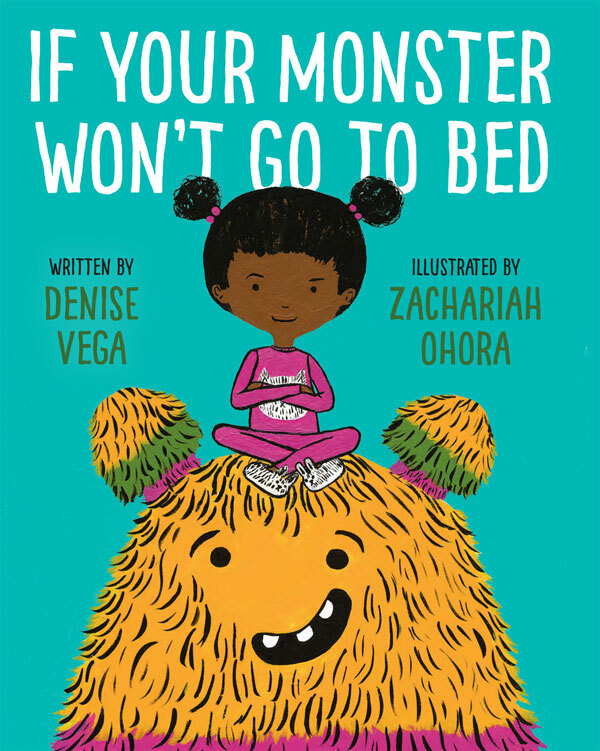 The plot came first–this idea of an instruction manual for putting your monster to bed. Then I heard the unseen narrator’s voice in my head. I had originally envisioned the story with dialogue bubbles coming in from the sides and then maybe getting a glimpse of the narrator slipping away at the end. But that changed as I continued to hone and revise the story. Because of the second person point of view, the characters are actually the narrator and the listener/reader (represented by the girl in the story) with the narrator taking center stage in terms of voice and the girl coming into her own through the text and a lot through the illustrations. The ending reflects me coming to terms with these two characters. Early versions ended with the child playing after the monster is (supposedly) in bed, but something didn’t feel quite right with that approach. It wasn’t until I circled back to the narrator at the end that I got that “Yes!” feeling and knew I’d found my ending. I had so much fun coming up with all the silly things that were the opposite of when you put a kid to bed and loved creating the hyphenated words! It was just a big Wordplay Fun Fest! Can you share your favorite line? My favorite line by far is the last line after the narrator tells listeners not to ask their parents for help: “It’s not their fault; they’re just not good at it.” It still makes me smile when I read it. Were you afraid of monsters when growing up? that down makes it sound like I believed there was a whole family of monsters living in my room! Good grief. With the start of a new year, comes resolutions. One of my writing resolutions was to be more consistent with submitting my polished stories. To help me achieve this goal, I decided I needed an organized way to manage submissions. That is when I first developed my submission schedule and broke it down into three parts. First, I decided that since I had put time and energy into writing my manuscripts, I owed it to myself to set them free into the querying world. 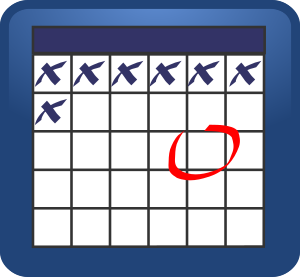 I picked a time frame that felt comfortable for me and put it on the calendar. Submission Sunday was born. That is when I either spend an hour researching or writing queries to send out. Next, I needed a way to track my submissions. There are many resources that writers can use, Query Tracker, spreadsheets, or a simple spiral bound notebook, which is what I decided to use. I’ve tried to maintain tracking on the computer in the past and I haven’t followed through. Using a simple spiral bound notebook that I keep close to my computer is something I will be more diligent in maintaining. Finally, I set goals. It was important to me to decide on a number of queries I wanted to send out each week which felt attainable. Two weeks in, I am right on track. I know there may be weeks where I won’t be able to send as many or weeks where I may send more. Do you have a submission process? Staring at a blank screen or page can evoke a similar response from me, unproductivity. What is the cure for lack of inspiration? For me it can be different things on different days. Here are a few suggestions to help you work around writer’s block when it strikes. Often times my best ideas come to me when I’m not sitting down to write. Take the dog for walk, go for a run, or hit the gym. The benefits are twofold. Two heads are better than one! If you are a part of a critique group, you can put your creative minds to work and overcome the obstacle. A spouse or trusted friend can provide the same support. Take a trip to your favorite bookstore or library and fall into a good book or check out a book on the craft of writing. Browse the web and visit other writing blogs. Hit up the newsstand for something unrelated. If you like to journal or keep a diary, write a new entry. Visit a website for a daily writing prompt. Write the same scene in a different point of view. Bring your laptop along to a coffee shop, park, or your back porch. Sometimes, seeing new sights, smelling new smells, or tuning your ear to new sounds can help to jump start creativity. What about you? How do you overcome writer’s block? It’s been several years since I enjoyed children’s literature as a child. But, no matter how much time passes, I remember the excitement of reading a beloved story from way back in the day. The first picture book I made my parents read to me night after night was THE MONSTER AT THE END OF THIS BOOK. I don’t know if it was Grover, a favorite character from Sesame Street, that captured me. Or if it was the plot of Grover begging the audience not to read one more page because of the monster at the end. 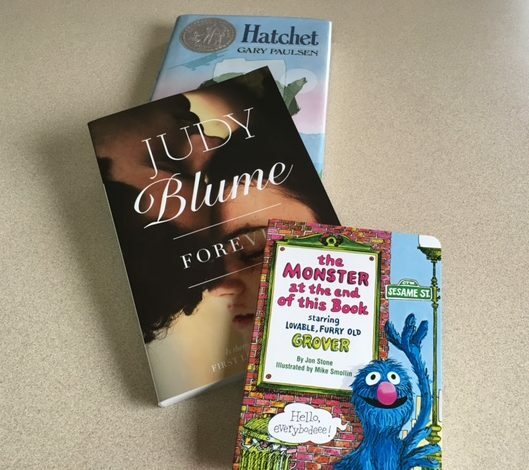 SPOILER ALERT: Little did Grover know, that he was the monster at the end of the book. If Grover epitomized my early years, HATCHET embodied my reading during middle school. It was Brian Robeson’s survival story that hooked me. I felt like I was watching a movie, a thriller, and I had to know how it ended. I hadn’t read anything like it up to that point. It was my crossover from sweet and fun books to daring middle grade. My tastes continued to evolve over the years. While I grew up listening to and reading Judy Blume books, I discovered one of my favorites, FOREVER, in high school. The book and Judy spoke to me about love, the love of your life, and break ups. Something, I didn’t have much knowledge about but was anxious to experience. In a way, reading these stories helped me comprehend things that weren’t in my world. While I enjoyed these books when I was young, they have stuck with me and I think of them fondly, like a good friend. What about you? What book memories do carry with you from back in the day? One of my favorite activities at a writing conference is learning about the recently released books. As a teacher, I’m looking for books to add to my classroom library. As a parent I’m looking for books to capture my kids’ interests. As a reader/writer, I’m looking for something inspiring. The last conference I attended, SCBWI Letters and Lines in September 2015, did not disappoint. I picked up Todd Tuell’s picture book, Ninja, Ninja, Never Stop! I have two pint-sized ninjas at home who I knew would love it! I think they picked up some cool moves after reading. And it’s one I can share with my school kids too. The ninja topic paired with the rhythmic rhyme is a homerun for both sets of kids! Another treasured find was Sean Ferrell’s picture book, I Don’t Like Koala. While you think you know the whole story, when you get to the end, there is a fun twist. It’s humorous for kids and adults. And little did I know at the beginning of the school year, when I read The Kissing Hand to my kindergarten class, I would be picking up my very own copy at the conference. Only this one was signed by the very talented illustrator, Ruth E. Harper. When I took it to school my class was in awe. It was inspiring for them to see something autographed from the person who makes stories come to life through illustration. Finally, I was disappointed when I was unable to pick up my own copy of Tara Dairman’s middle grade novel, All Four Stars because it was all sold out. Lucky for me, one of my critique group member snagged a copy and let me borrow it. Tara has a feel for the flow of a story and I was swept up from the beginning. For the record, that read wasn’t for my school kids or for my own kids, it was a perfect fit for me. What about you? 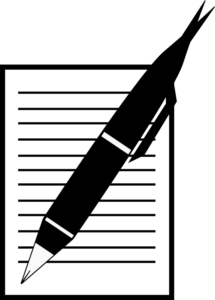 What is your favorite find from attending conferences?